Download the program and install it - it is Free! For me there is nothing better than StartIsBack. Only drawback is that it is not free but the price is still very good. I agree about startisback...that is what use. I am using StartW8, it's free. But after all I found using windows metro is faster with typing the software name without searching. 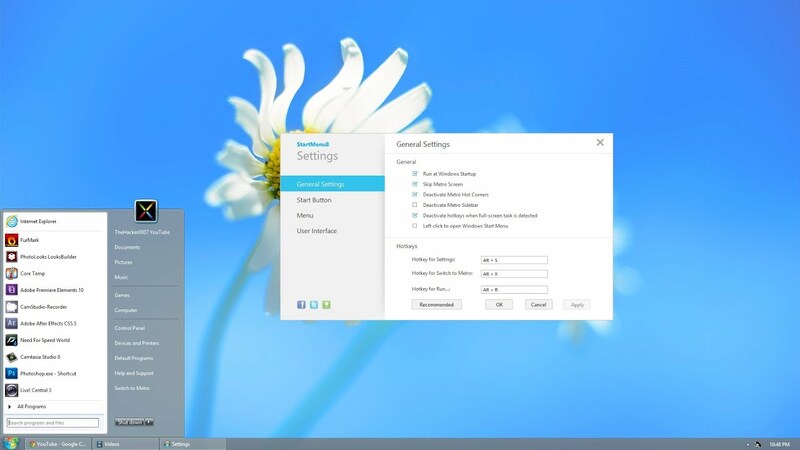 Why You don't like IObit Windows® 8 Start Menu, it is freeware and not worse then some paid versions. I have some of them, but for long time use only this. Read more and try, if you haven't still tried. It may be installed if some other is already installed, simply disable autostart for others. You have many settings and styles to choose. If You like Windows 7 style, choose it, if Windows 8 style - choose it. Classical Shell is perfect solution. for free, Classic Shell is very good (Classic Shell - Start menu and other Windows enhancements). I use it on a number of family computers, but use Start8 from Stardock on my main computer. While Start8 is a bit better, Classic shell still does the job well. The tile-based Start Menu Reviver comes closest to the Start Menu found in Windows 10 . The left-hand column offers shortcuts to critical system features, including your computer and personal folder, Control Panel, Task Manager, and the Run menu. The second column from the left provides space for your most regularly used applications. The list of all your installed applications comes up when you click the All Apps tile or when you move the mouse from left to right across the Start Menu. I really like classic shell. Being able to change the start button icon quickly is really cool. I have used startisback and it is very good. But I chose to stick with the freebie giveaway. Classic shell supports 8 and 8.1 If for some reason you have not done the FREE update to 8.1 from 8 you should do so. It turns on several hidden features (#1 being Winkey+S opening a search everywhere) and fixes some issues with the tile page workings. This will make life easier whether you decide ya or nay on a start button option. Hi , i think the old start menu of win7 isn't a great think i prefer the start menu of win8/8.1 "we have to change"
In my opinion Classic Shell is the best free program to enable start menu in Windows 8/8.1.